One of the most common types of bath faucets is a center-set faucet. They’re available in a wide selection styles and prices, and are generally easy to install. 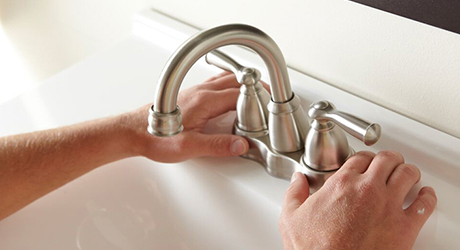 This guide will help you properly install a center-set bath faucet. Tip: If you have cultured marble or other composite sinks, we recommend you use silicone caulk as plumber’s putty may discolor the sink. Safety: Use towels to cushion your back and wear eye protection when working under the sink. Remove all items from under the sink. Place a bucket, pan or rags under the work area to catch excess water. 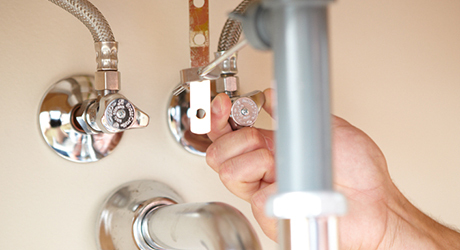 Turn off the hot and cold water supply lines at the shut-off valves beneath the sink. If there are no shut-off valves, turn off the main water supply. 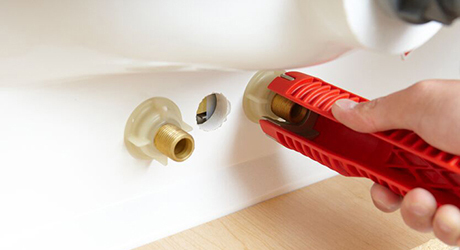 Turn the faucet on to release the pressure in the water lines and let drip until empty. Remove the old supply lines and the mounting nuts. Apply a penetrating lubricant if the lines or nuts are corroded or in a hard-to-reach position. Lift the faucet fixture from the top of the sink. A putty knife can remove all of the old sealant from the top. 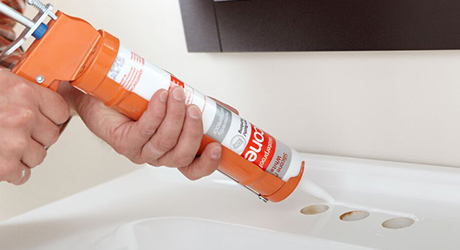 Use a cleaner suitable for your sink type to clean the area. 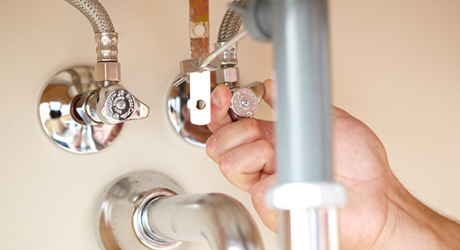 Apply a bead of plumber’s putty or silicone caulk around the bottom of the faucet. Assemble the faucet following the manufacturer’s instructions. 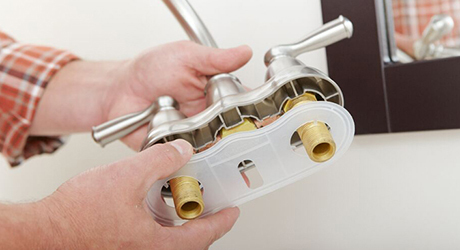 Place the faucet gasket over the tailpieces so that it is between the sink and the base of the faucet. The valves should fit into the hole spacing in the sink. Insert the faucet so that the base is parallel to the back of the sink and press the faucet down firmly. Thread each basin nut, alternating from one to the other to draw the faucet body evenly over the gasket. Do not tighten all the way. Measure from both sides to center the faucet body on the sink. 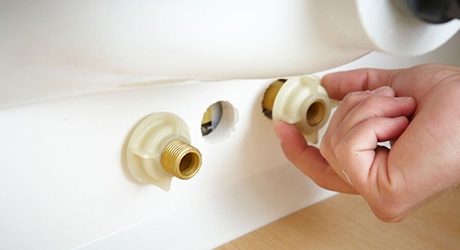 From beneath the sink, screw the friction washers and mounting nuts onto the faucet tailpieces and tighten them with the basin wrench or faucet and sink installer tool. Attach the supply lines to the faucet and angle valves. 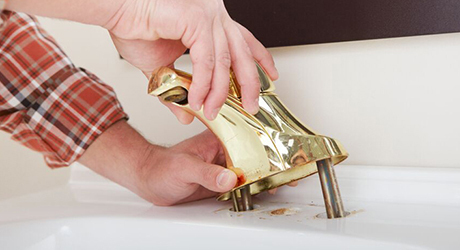 Wipe away any excess putty from around the faucet base. Turn the water back on at the angle valves. Turn on the faucet and allow both hot and cold water to run for one minute. If supplied, install the matching pop-up drain.